Lighthousing.net • View topic - "Rescue Men: The Story of the Pea Island Surfmen"
"Rescue Men: The Story of the Pea Island Surfmen"
Re: "Rescue Men: The Story of the Pea Island Surfmen"
In the 1870s, at the Pea Island Life-Saving Station at the Outer Banks, a station keeper who bungled a rescue was fired and replaced by Richard Etheridge, an African-American who was one of the best surfmen on the North Carolina coast. 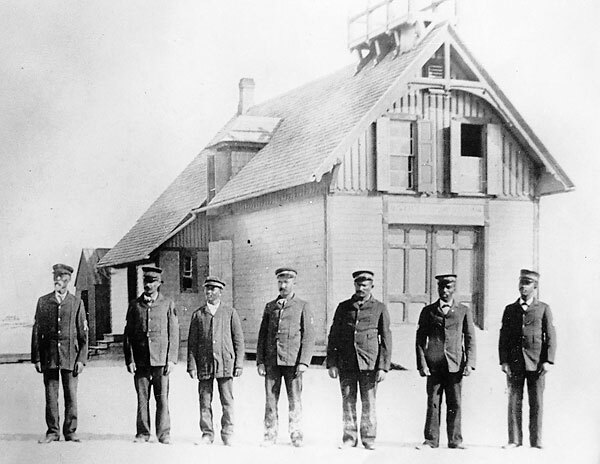 Under the racial standards of that time, everyone under Etheridge’s command also had to be black, so the station became the only one to have an all African-American crew. That crew was posthumously awarded the Gold Lifesaving Medal in 1996 for its heroic 1896 rescue of all nine passengers on the three-masted schooner E.S. Newman during a hurricane. Today, their efforts are honored at the Chicamacomico Lifesaving Station in Rodanthe. Visit http://www.chicamacomico.net.